Photo Tours For photo tours need some additional knowledge: - Shooting animals, especially birds require special equipment, with a lens minimum of 300 mm. The best results when shooting out from land on the banks of canals and lakes, where it is possible to walk. - Is necessary a camouflage for a good success and to be able to take pictures as closer to the subject. - Tripod is a great solution to the photo on land, in the boat is not recommended. It can be take photo on the tripod when the ship sailing, using some bags of sand, rice, beans which are useful to reduce engine vibration of the ship. - During photo tours of the boat or land, phones will be closed and all other sources of noise will be eliminated. - Bright colored clothes should be replaced by color as close to ambient; camouflage type colors are useful at any time. - Will take into account the weather, water level, type of the habitat. The installation of towers proved to be unsuitable in Danube Delta. It is better shooting from the boat, especially those that are well sound insolated. 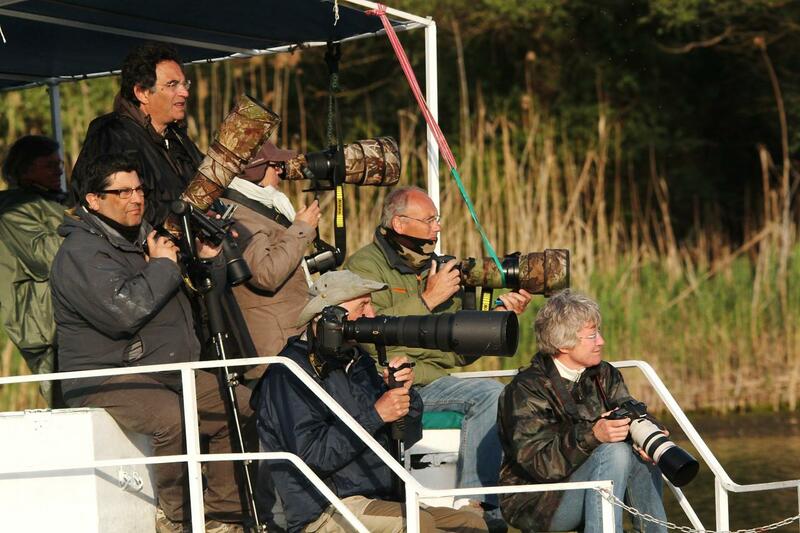 - Will take into account the in which period to visit the Danube Delta for photographing. In spring, especially April and May are dedicated to bird migration and is the period when most species are seen. Migration of small birds is concentrated mainly in the period April 20 -20 May. It’s a month when besides the migration can photograph with success the nesting of terns and tern, the spectacle prigorii. A spectacle that is in addition to the spring plumage of birds and especially color given by water are yellow iris and water lilies or specific to delta. - June is special for shooting birds with little babies. Corcodeii chicken, ducks, geese, herons and many other species tend to walk out in groups, which are the most exciting moments for a success photo. This month is interesting to photograph pelicans, waters relatively high enable boats to enter the feeding areas of pelicans. Obviously, boats have to be as little visible as not to disturb the birds from meal and for a success photo. Is the month when the first water lily bloom occur which increases the opportunity to capture high-quality photo and composition. - During the summer months July and August are particularly for the pelicans number, the large number of shore birds found in migration. It’s also the time when all ranges of herons, egrets, herons and spoonbills are aligned along with the canals.It's time to most birds can be photographed up close, especially from small distant. Photography is spectacular especially in the morning, but afternoon rain brings unforgettable images. - On the boat is 220 V current, and can recharge batteries. On the boat is possible to transport photographic material as: tripod, camouflage tent, cameras, and lens. -Groups of photographers on a boat is preferable to no more than 8 people. for larger groups using two boats. Each ship has a refrigerator, kitchen staff, lunches is served on ship and you have the opportunity to be independent and to shoot all day. Boats are stable, flat terraces at different levels. We use and motor boats for shallow water areas, the number of photographers in a boat is a maximum of four persons. - Our guides speak fluent english, french or italian, and on request if is necessary and other languages. -Guides are passionate photographers and ornithologists, know very well where there is a specific species, concentrations of birds, and the moment of photographing. - For a complete success we recommend a tour of six days in delta and two on shore (especially for photographing bee eaters).